One of the best places in Lagos to find a top class restaurant is in the Lekki Peninsula in Lagos. In this post, we take a look at the 5 best restaurants in the Lekki Peninsula. Lily Gate Hotel is one of the major hotels in the country. 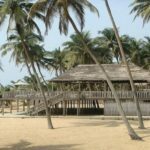 It is located on Lekki Peninsula in Lagos state. 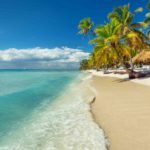 The hotel has 74 rooms including 6 suites and a full range of facilities which includes a conference facility, restaurant, bar, swimming pool, gym and free Wi-Fi. The restaurant at Lily Gate Hotel is one of the best in Lagos. The name of the restaurant is Dunya which is the Hausa name for world. And this name is reflected in the delicacies on the restaurant’s menu. There is also a lounge bar on the ground floor of the hotel which can be used for social or business meetings. There is also a luscious garden in the vicinity which creates an atmosphere that enables guests unwind with a cool drink. 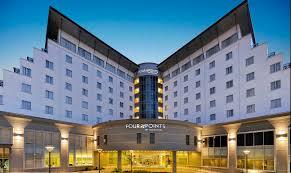 Four Points is a hotel with excellent fine dining options. 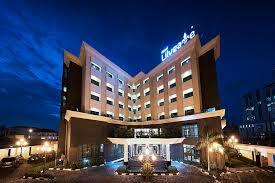 Also, the hotel has a full service spa, fitness centre, pool and free high speed internet. There are five dining options which include a rooftop bar with panoramic views as well as a contemporary buffet restaurant that serves international and Nigerian cuisines. Located on 26 Admiralty Way, Lekki Phase 1 (opposite Domino Plaza), Brizz Lounge is one of the foremost restaurants in Lekki. 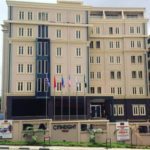 It has a lounge with a nice rooftop terrace looking over the second half of the Admiralty way in Lekki Phase I. The best part of the rooftop view is when the street lights are on as you can unwind with a drink while enjoying the Admiralty way view. Peppercorn Avenue is Lekki’s first Indian and Thai Cuisine. At this restaurant, you get to experience hand-picked recipes from India, Thailand and China. The history of Peppercorn can be traced to the founder’s commitment to deliver great tasting food that is unique to Lagos yet authentic to Thailand and India. The chefs at Peppercorn are said to be one of the best in town and the ingredients used are handpicked from some of Asia’s largest spice markets. Peppercorn Avenue is located on 6A, Otunba Adedoyin Ogungbe Crescent, Off Admiralty Way, Phase 1, Lekki, Lagos. Sailor’s Lounge is a fully furnished, relaxed & adventurous lounge with the ambience of a sea view that compliments the atmosphere for unwinding, business networking and water view. The lounge is home to three wonderful sections: Sailor’s Bar, Captain’s Cabin and Captain’s Deck. 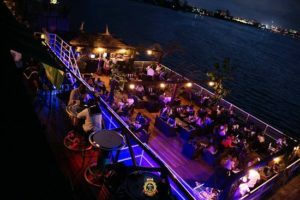 The Captain’s Deck is the first floating bar in Nigeria and it is specifically designed to capture the experience of floating atop the ocean for maximum enjoyment. 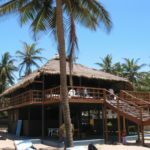 The lounge is one of the leading lounges in Lagos Nigeria, with skilled employees headed by an experienced General Manager and a Celebrity Chef. Also, the menu engineering is done to override all competitive menu and our programmes are designed to give a lasting memory of fun and enjoyment. Over the last 3 years, Sailor’s Lounge Lekki, has grown significantly to become a respected and capable convenience provider and a hub where fun meets with nature. Sailor’s lounge adheres to rigorous quality controls in place, a comprehensive product range from continental meals to assorted drinks sought from the original manufacturers and a proven capacity to deliver quantitative and qualitative products and services to corporates and individuals. 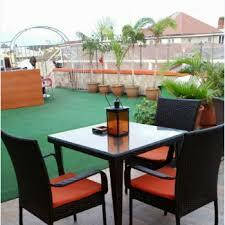 The lounge is located along the Lagos lagoon at Plot 1, Block 12, Admiralty Road, Lekki Phase I. Road Chef was launched many years ago and provides a restaurant experience like no other. The origin of the restaurant can be traced to the city of Houston in the United States of America where the founder began his journey into provide an amazing restaurant experience. Currently, the team at the Road Chef is made up of food experts and chefs providing high quality eclectic delicacies. The restaurant menu includes delicacies from the South East, South South West regions of Nigeria. These include the likes of amala, eba, wheat, semo, jollof rice, ofada rice, afang, ogbono, oha, egusi, bitter leaf, efo riro, banga, white soup, edi kaikong and many others. Incorporated in 2003, Marcopolo Cuisine is associated with the Chinese Cuisine and it is a major brand in the catering and restaurateur space. The company’s head office is located in Victoria Island and it has several restaurant locations in the state. Marcopolo is known for its proven track record when it comes to quality and hygienic foods as well as outstanding customer service.